January ended with a delightful cultural event by the students of our Nabadisha centres as they celebrated learning in various forms. With music, dance, drama, art and creative writing, the afternoon at Rabindra Tirtha was filled with vibrance and warmth. This occasion marked the culmination of a drawing and creative writing event that was held at 10 Nabadisha centres on 30th January. 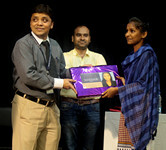 Awards were distributed to students who had exhibited exceptional talent in drawing and creative writing. Among our honourable guests were R.P. Yadav. MD and Chairman from Genius Consultants Ltd. and his team. Eminent singer Siddharth Ray, eminent percussionist Mallar Ghosh and elocutionist Mallika Ghosh, whose presence and performance helped to make the event memorable. 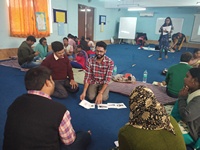 In an attempt to stress on the undeniable importance of language at early years, Vikramshila conducted an Early Language Learning Course (ELL), supported by Wipro. It was spread over three contact periods in May, August and January. 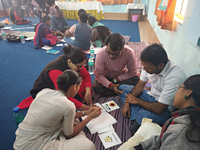 We had 22 participants from different organizations working in the field of education in their communities from 7 states in India – Karnataka, Manipur, Madhya Pradesh, Uttar Pradesh, Bihar, Chhattisgarh and West Bengal. The course equipped the participants to understand the importance of oral language development. It also helped them to design and conduct various reading and writing activities. A special focus was also on Multilingualism and Teaching English as a Second Language. A diverse linguistic group offered rich inputs into the discourse of early language development and shared their perspectives and field experiences. Students of class 9 and 11 in four schools in Kolkata organised a day long programme to generate awareness among fellow students the need to choose an occupation that suits their capabilities and their aspirations. The day in each school was filled with activities and events that help students articulate their views and knowhow on their career choices. The students with the help of our E2E team had brought in alumni, some motivational individuals who dared to choose professions that were not necessarily conventional. The zeal of the students helped the school administration to also warm up to newer professions, skill-based education after school and shaping their passions into professions. An exciting day of fun were spent with 47 children of our Naba Disha centers and their 6 teachers. They were taken to New Town Eco Park where they had lots of fun, food, played games and visited the installations of the Seven Wonders of the World. This was made possible by the CSR initiative of Genius Consultants Ltd. Swapnesh Kumar , Kaushik Mazumdar, Prabir Chakraborti of Genius deserve special mention. Our children also got an opportunity to interact with them. We feel so wonderful to have started working in Uttar Pradesh in the field of Early Childhood Education. This is our sixth regional office! With our main office located in Lake Gardens Kolkata, we are spread in other parts - Burdwan, Malda, Murshidabad, Howrah, Bankura. 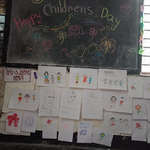 Like always, Children’s day in our Nabadisha Centres is celebrated with a bang. Each centre celebrated it in a unique way. Musical chair, art, dance and various activities galore. Overall it was a day full of joy and colour where enthusiasm was really high. To celebrate and cherish the success of some of our Nabadisha students in board examination of 2017-18, an event was organized for the students. 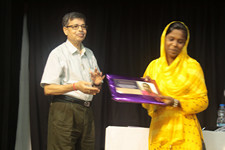 Nearly 500 students, 21 teachers and 15 Alumni members of 10 Nabadisha attended the event. 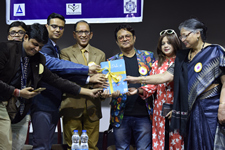 The event was chaired by the officials from Genius Mr. R.P Yadav (Vice President), senior police officers Mr. Satyajit Bandhopadhyay, chairperson of the West Bengal Commission for the Protection of Child Rights Ms. Ananya Chakraborti, and Director of Vikramshila Ms. Shubhra Chatterji. After a speech by the guest, it was time for reflecting and remembering the journey and experience in Nabadisha by the Alumni.